Picture this: The sun is shining, there’s a crisp blanket of snow on the ground, and you’ve got the day off with the kids. What, are you just going to sit indoors, eyes glued to the screen, twiddling your thumbs? Heck no! Fresh air and the great outdoors are not off limits just because it’s kinda cold outside. Not at all. 3523 Delbert Road • Eau Claire • Pinehurst Park is simply one of the best, and our readers recognized that giving it the most votes. On Eau Claire’s north side, the behemoth Pinehurst Hill stands as the mother of all sledding hills. This formidable giant was a downhill ski run with a towrope throughout the early ’70s, and now Pinehurst Park is taking shape as a winter recreation mecca right in our backyard. Sledding and tubing make for a fun day, but you could also snowshoe, cross-country ski, pedal a fat tire bike, or hit the ice rink if you’re feeling adventurous. And 6-8pm each Thursday in January and February, the park is host to a fabulous, free snow-based social, Winter After Hours. 822 Emery St. • Eau Claire • Right next to the Forrest Hill Cemetery on the Eastside Hill, 7 Bumps (a.k.a Forrest Hill / a.k.a. Dead Man’s Hill) is steep but straightforward, with no major obstacles – just the thing for little ones (or weak-hearted parents). Its easy accessibility has made it a favorite among area snowboarders, tubers, and sledders alike. It’s easy to get to and primed for winter fun, so stop by sometime. N791 Bruce Mound Ave. • Merrillan • Although it’s technically outside the Chippewa Valley, the one-hour drive to Bruce Mound Winter Sports Area in rural Clark County is worth it for tubers, skiers, and snowboarders alike. 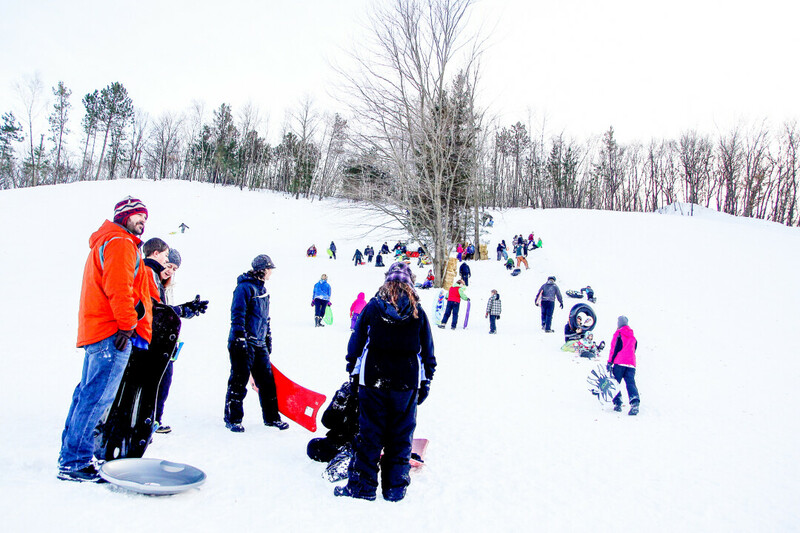 Bruce Mound – which is open most Fridays, Saturdays, and Sundays from mid-December to early March – features five snow tubing runs with a rope tow. If you’re more ambitious, tackle one of the 10 slopes for skiing or snowboarding (two beginning, two intermediate, and six advanced) reachable via five lifts. There are also lighted trails for night skiing, a complete rental shop, a ski school and ski patrol, and a chalet where you can warm up and get something to eat. For a full list of prices for lift tickets, rentals, etc., visit www.co.clark.wi.us/brucemound.